So while I was getting my dinner ready ( lobster with cream of corn), I also had to think what i was going to fix for him and the rest of my family. It was going to be easy: brats and potatoes. Peel the potatoes and cut them in 1 inch cubes. Rinse the potatoes well under running water and steam them as you would normally. I am choosing to steam them with Demarleathome cookware as it allows me to steam most vegetables in very little time. I place them into the large round mold. Add a pinch of salt. Place the octogonal silpat on top of the large round and cook the potatoes for 6-8 minutes. IF THE MOLD IS FULL TO THE TOP, COOK THEM FOR 8 MINUTES. IF IT IS LESS, 6 MINUTES IF ENOUGH. Meanwhile, prepare the caramelized onions. Drop 1 tbsp of olive oil in a large saute pan, and warm it up. When the oil is hot, add the sliced onion and cook over medium high until the onions are becoming a nice dark golden color. Set aside. 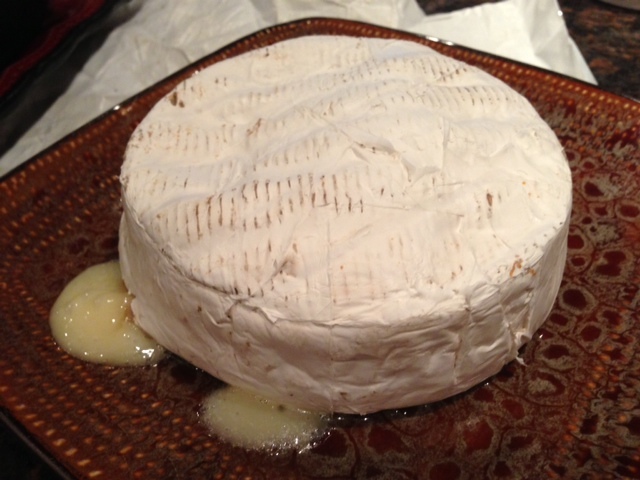 Remove the brie from its paper, place it on a plate and cook in the microwave for 2 minutes. 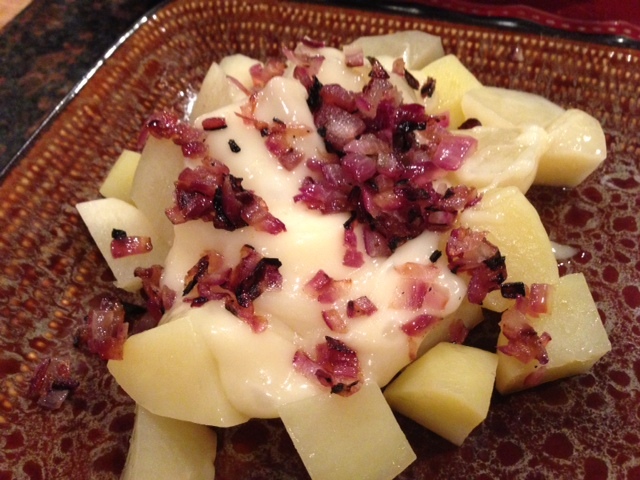 Divide the potatoes equally among each plate and drizzle the melted brie over the potatoes. Sprinkle some of the caramelized onions and enjoy!